Manufactured using mandrel-bent, mild steel tubing and surface-ground, thick steel flanges, PaceSetter Headers are available with standard black painted finish or Armor*Coat, a polished, 2000 Degree F, metallic-ceramic coating. Each header undergoes an extensive preparation phase followed by two applications of the coating and a high-temp curing process. The Armor*Coat won't discolor like paint, chrome or dull finish coating, reduces underhood temperatures, resists rust and corrosion and is easy to keep clean. 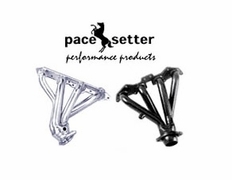 All PaceSetter Headers come with hardware, gaskets and illustrated instructions and are backed by a three-year warranty.